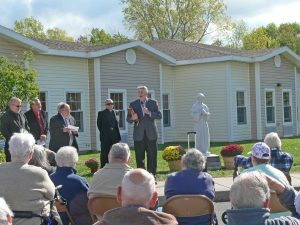 A community celebration and dedication of a new statue of St. Francis of Assisi took place at St. Francis Commons Assisted Living Residence in Oswego. The new statue marks the location of a former orphanage, Catholic High School, and is now the St. Luke healthcare campus on the city’s east side. 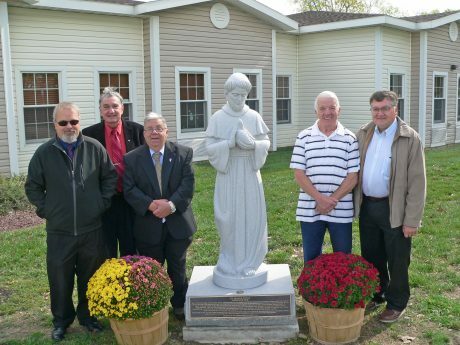 The Oswego Knights of Columbus Council #227 commissioned and erected the statue. Pictured from left: Knights of Columbus Council #227 members Mike Plunkett; David Brown; Charles Barsi; Robert Lupa and David Delles. OSWEGO – A community celebration and dedication of a new statue of St. Francis of Assisi took place at St. Francis Commons at St. Luke Assisted Living Residence in Oswego. The new statue, which marks the location of a former orphanage, Catholic High School, and now a healthcare campus on the city’s east side, was commissioned and erected by the Oswego Knights of Columbus Council # 227. Knights of Columbus Council member Charles Barsi welcomed all those gathered and recounted a brief history of the site that included a convent and orphanage started by the Order of Sisters of St. Francis in the late 1880s, which came to be known as St. Francis Home. After the orphanage closed, the buildings were converted into the Oswego Catholic High School in 1953, then Bishop Cunningham High School, until the high school’s eventual closure in 1992. Subsequently, the property was acquired and developed by St. Luke Health Services, and is now the site of Bishop’s Commons Enriched Living Residence, Little Lukes Childcare Center and St. Francis Commons Assisted Living Residence. Barsi explained that the Knights of Columbus commissioned Oswego Count Monuments to design the marble statue in tribute to both the history of the location to its current use. The ceremony include a blessing lead by Deacon Nick Alvaro, Rev. Richard Morisette and Rev. George Wurz. In attendance were representatives from the Knights of Columbus, alumni of the former Catholic High School and members of the community. A statue depicting St. Francis of Assisi was dedicated during a recent ceremony held at St. Francis Commons Assisted Living Residence in Oswego. Pictured greeting those in attendance at the statue dedication is Deacon Nick Alvaro and members of the Catholic clergy including Rev. Richard Morisette and Rev. George Wurz and Knights of Columbus Council members. At the conclusion of the ceremony, Barsi invited anyone wishing to share his or her experiences related to the site, and a number of Catholic High School alumni spoke with great fondness about high school experiences, including Kelley Comerford Greene, now Director at St. Francis Commons, who attended Bishop Cunningham High School until its closing. A reception followed the dedication, hosted by the St. Francis Commons Resident Council. The new statue of St. Francis of Assisi is on display outside of the main entrance at St. Francis Commons, 12 Burkle St.